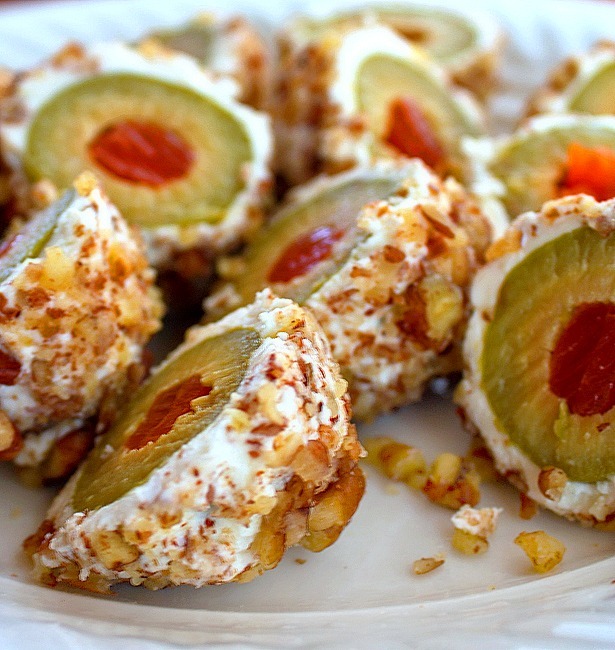 Cream Cheese Wrapped Olives are an easy to make appetizer made with three ingredients. They transport easily to parties, game day tailgating or BBQ’s. Your going to love these little treats! This is a fantastic little appetizer that only requires 3 ingredients and minimal time to prepare. Cream Cheese Wrapped Olives are made with large cocktail olives, but can also be made with regular olives. I’ve made them with both sizes and they are always a hit. This appetizer comes together quickly, then refrigerated until you’re ready to serve. Right before serving, cut the olives in half and arrange on a plate, that’s it! Cream Cheese Wrapped Olives are travel friendly making them very easy to take to dinner parties or picnics. And let’s not forget football season! Easy and delicious, it doesn’t get any better than that, ENJOY! Cream Cheese Wrapped Olives...This is a fantastic little appetizer that only requires 3 ingredients and minimal time to prepare. It's a very travel friend. The best way that I can describe getting the cream cheese onto the olive is to envision someone making truffles. Dry the olives with a paper towel, with a knife slice a small portion of room temperature cream cheese and put it into the palm of your hand. Place the large olive on top of the cream cheese and wrap it around the olive. When its covered, shape it into a little football, making sure that the pimento is on one side so you know how to cut it, you want it cut in half not length wise. After it's covered, roll it in crushed nuts. Put the cream cheese wrapped and nut covered olives into the refrigerator so the cream cheese firms up. Slice when your ready to serve. I made the Wrapped Olives yesterday for Thanksgiving Appetizers. They were popular & tasty. Cream cheese goes so well with olives. I wanted to share a tip or two: #1) In addition to drying the olive before doing the cheese wrap, I made sure to turn the olive upside down (pimento side down) over the jar and drain any additional juice OUT of the olive. #2) I used a regular teaspoon when taking from the package of cream cheese and with the curve of the spoon I took my thumb and flattened the cream cheese a bit, then added the olive on it (it fit perfect). Slid them both off the spoon and then patted the cheese around the olive. Shaping it on the spoon made a more even distribution around the olive. #3) I rolled them in crushed almonds that worked just as well. Before serving but after cutting, I stuck each with a toothpick and plated them with individual grapes around. I will use this again. Thanks for posting. That’s a helpful tip. I’d like to try it but it looks tricky. This is one of those “simple” recipes that would be better as a video so we can see how to get the cream cheese onto the olive. Thanks for the advice. Good tips! With your teaspoon suggestion I think it would be easier to cut the olive in half first and snuggle the olive into the teaspoon full of cream cheese. Also, if I make these, I would refrigerate them first, then dredge them in bacon bits. Nice Roxanne, bacon bits would be great! Hi Martha how about sesame seeds, pine nuts, pepitas (pumpkin seeds), sunflower seeds. I made these for a Christmas Party because of the red and green from the olives and it was simple enough. I used a jar of Spanish olives. I simply put a slice of cream cheese into my palm and flattened it a bit, added the olive, and shaped the cream cheese around it. The jar had 27 olives and I had just the right amount of cream cheese for the whole jar. So I’ll plate 54 on my serving tray, that is to say if all of them make it. I have a feeling I will be sampling them before the party! Making them is easy Ann, it’s keeping your hands off of them that’s the hard part! LOL! I hope everyone loved them, thank you for taking the time to come back and tell me you made them! Awe, I love recipes that remind people of their mama’s Cher, thank you for taking the time to come back and comment! My grandmother made a sandwich of cream cheese, chopped peanuts and chopped olives served on white bread, it is still one of my all time favorites. Cannot wait to make these! A sandwich Sharon!! I’ve never heard of doing that. I bet it’s wonderful, thank you so much for coming to visit. I hope you love the Cream Cheese Wrapped Olives!